Epitaph, Labuan Memorial, Panel 19, Age 36. Soldier was Wounded in action at 1700 hours on 8.2.1942. Admitted to 2/13th Australian General Hospital on 9.2.1942 with shrapnel wounds to his left forearm. Transferred to 2/9th Field Ambulance on 22.2.1942 and discharged to unit on 8.3.1942. Read further about D Company. 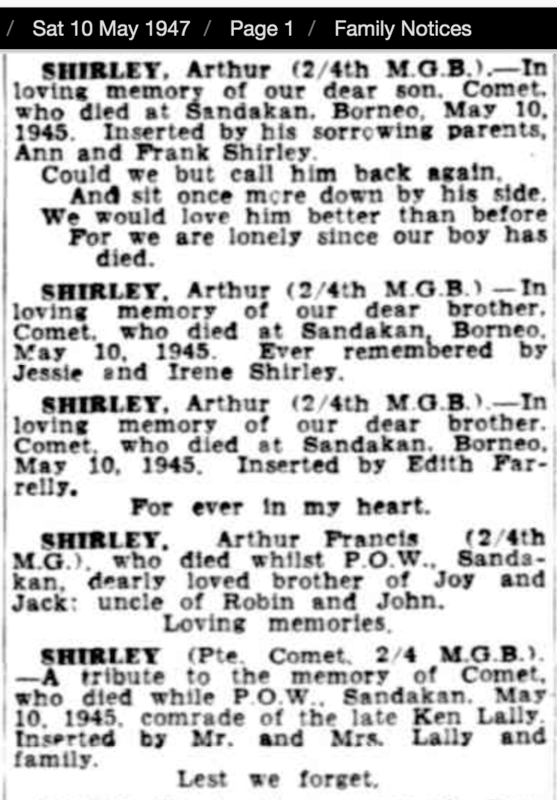 ‘Comet’ Shirley was selected in Singapore with ‘B’ Force to sail to Borneo. Please read further about Sandakan and ‘B’ Force. Above notice from 2/4th mate Ken Lally’s family. Ken was a POW in Japan when he died in March 1945 in a coal mine fall. Above notice from 2/4th’s Wally Holding and WX8532 Wallace George Bruce Kenney. SHIRLEY, Private, ARTHUR FRANCIS, WX8535, A.I.F. 2/4 M.G. Bn., Australian Infantry. 10 May 1945. Age 36. Son of Francis and Annie Shirley; husband of Alice Mary Shirley, of West Northam, Western Australia. Panel 19. Francis (Frank) Shirley (Snr) married Annie Louisa Howard in Victoria about 1893. They moved to WA before 1898. They had a family of two sons and 4 daughters. 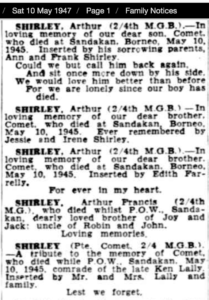 Annie Shirley died in 1947 and Frank died in 1950. ‘Comet’ married about 1940 to Alice M. McBride in Perth. They had one son Garry. Alice remarried about 1952.